There is a holiday spirit in the air in Chicago. The city is teeming and the beaches are swarming. And all day and night the city appears to be en fête. We made the trip to the Shedd aquarium yesterday. The secret is to be a member and get there early. Otherwise the crowds at this time of year are overwhelming. Its a splendid place for families. 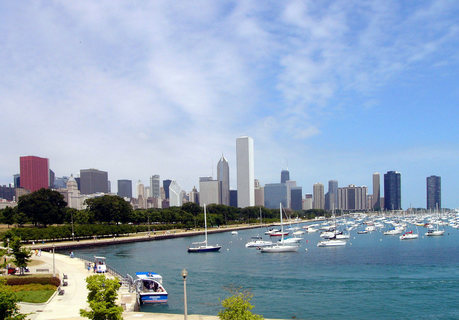 And its location on the lakeshore to the South of the city provides this stunning view of the Chicago skyline. A perfect example of the rarities that he possesses was playing when we arrived. A Schumann CD by Vladimir Sofronitzki - the father of Viviana whom avid blog readers will remember as that pianist I met in Warsaw in June. (see my posting of June 22). Today has been a welcome opportunity to catch up on domestic chores - and to post something here! It is great to be back in Chicago in the knowledge that I will be here for four weeks without any further travel. It has been a hectic four months so this will provide some relief as well as the opportunity to get some important things done. As we wrap up our fiscal year at the end of August we still have work to do on contributions for the current year. So if there are any readers out there who value COT's work who have not yet made a contribution this year then now is the time to do it. And it would be wonderful to be able to start our new year with some certainty that we will get to its end intact financially. So we would love to have pledges for 2006 now, with a commitment to make the donations some time before we have massive expenditures for the season starting in January. This is when rehearsals begin for our first production. And now I am going to be able also to enjoy the many great summer activities here in Chicago. Notable of course as always are the Grant Park Festival and Ravinia. And I am looking forward to taking our daughter to the Shedd Aquarium. And much much more of course is available for visitors and residents of Chicago. Another great event in Chicago has one of our Marketing committee, Peter Debreceny, as a participant. Read all about how you too can participate here. Its been a good trip, very well organised and extremely fruitful. We have another soprano and two mezzos, of very different character. So Australia will be well represented in October. It is such a pleasure to be in this country and I look forward to my return in 2007 in spite of the horrors of this journey! I am now at the airport waiting for my flight to LA. Before hopping on the train this morning I caught the bridge in the cool morning light. Meanwhile Chicago is sweating it out with the max in Lincoln Park on Sunday being 104. Wow! It will be a cool 95 when I arrive on Monday afternoon. No, it has not really been that. 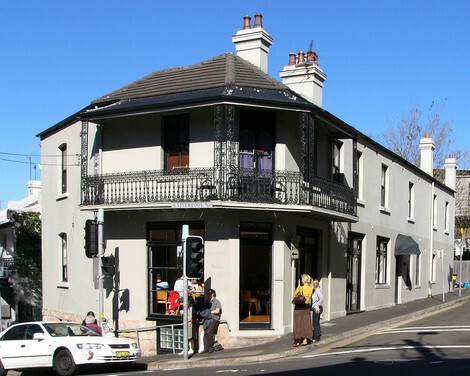 I walked at least 5 miles this morning exploring parts of t he city I had not been to before including Darlinghurst where I stopped for Brunch at bills- yummy, good value, and funky place. Sat at the communal table - whole thing totally down to earth and unpretentious. Remarkable given the hype. But just look at the completely unfancy exterior. This says it all. The evening was spent at the Australian Opera Foundation's final audition event as I mentioned yesterday. There was much argument over the result! Competition juries are usually considered by non-members (and in particular the public) to be cranky, and our Neue Stimmen one is often thought to be so; there wa a tremendous fuss made when a counter tenor won in 2003. He has since established a great career so maybe we were "right" then. We were certainly not as unanimous about it as the jury here were so anxious to asssure the audience they had been this evening. Anyway juries have varied processes to reach the "right" or "wrong" conclusion. Maybe they will turn out to have chosen a major star here. We shall see! The hospitality here is generous so I have been out gallivanting until now. It is 10.15 pm on Sunday evening. My flight leaves Sydney at 10 something tomorrow morning so given my feverish worry about lateness I will probably get out of here soon after 7.30 and propose to take the excellent train to the airport from Circular Quay down the street. So now to sleep. This morning was a leisurely walk around Sydney with a few shopping tasks. This is such a charming really small city - everything is within easy walking distance, especially on this early spring day. There is an excellent large department store called David Jones which has been serving the good people of Sydney with all their needs since 1838. And there are a number of delightful old shopping malls created long before the mall idea took root - the grandest of which is the Queen Victoria Building. There is also the smaller but no less delightful Strand Arcade. My photographs here may give you some sense of these places. Click on them to see full size. I then returned to the harbor briefly before going for a quick salad to fortify me for the afternoon. There was a huge crowd of the usual suspects, tourists and street entertainers. Plenty of didgeridoos on parade of course. And the harbor was bustling with water traffic. The auditions provided another rare pleasure - absolutely outstanding support at the piano from Sharolyn Kimmorley. The Sydney Conservatorium are so fortunate to have such a hugely seasoned professional from the field to be in charge of their opera department. Even greater sense is that she is a tenured half time staff member so remains, through her extensive freelance work, in touch with the real world where her charges will eventually make their living. I wrapped up this day at Rinaldo at the Sydney Opera House - not all of it I must confess. The jet lag is getting to me. But I was there long enough to recognize that it had been somewhat cut (no I was not asleep during the missing bits!) and quite splendidly conducted by Trevor Pinnock. And Rachelle Durkin, who was with us in Viaggio last season, was a fiery and brilliant Armida. I am only committed tomorrow to the Finals of the Opera Foundation Australia New York Study Award. This will give me an opportunity to hear further singers who did not make it to Neue Stimmen. However I see from the leaflet that I picked up from the Opera House this evening that two of their finalists sang to me this afternoon. More about that after the event. And now a brief look at the cricket between Australia and England taking place in London so still in progress of course at 9.30 pm Sydney time. And then sleep will overcome me. Its great to be here in 68 degrees after the inferno of Chicago. If this is winter then let me have more of it. My hotel is surrounded by press photogs waiting for Lleyton and Bec, Australia's new golden couple, who were married in the Opera House yesterday afternoon. Lleyton is Hewitt the tennis player, Bec is Cartwright formerly of a soap called Home and Away. They are staying here at the Intercontinental. This is the stuff that television dreams are made of. I had a very enjoyable meeting this morning with the talented couple who are designing our Entfuehrung, Andrew Hays and Kimm Kovac. Both are architects turned theater and TV designers. They are currently working on a new Australian TV series for Channel 7 here in Australia which will in fact debut on Channel 4 in the UK later this year. The UK is a major consumer of Australian TV soaps and series. Neighbours has run for years. This one is called Headland. It is a series with no less than 52 episodes to be shown two per week for 6 months. Sounds like good preparation for the joys of COT for which they can't wait! I had an excellent lunch with Sharolyn Kimmorley at the cafe attached to the Museum of Sydney. Crowded it was, and deservedly so - a definite recommendation for quality at relative speed. And then a walk down to the Harbour and a jaunt around it, and along the point to the Opera House. See what crowds there always are around this amazing building. Today was no exception - its a major tourist attraction. That must be good for ticket sales! Then took the train from Circular Quay down to Opera Australia's headquarters in Surry Hills where I had auditions of a couple of singers of possible interest to me for COT. Afterwards back to the hotel and a quick drink with Jenifer Eddy, the absolutely top soubrette in both Sadler's Wells Opera and The Royal Opera years (not saying how many) ago. She is the leading singers' manager in Australia and is widely respected for the remarkable work she has done for the last two generations of Australian singers as well as for her contribution to the general musical good of this country. And so I am now collapsing as predicted! Nothing a good long sleep can't fix. There is a another new boy to the world of directing US opera companies - Evans Mirageas. Just got this excellent news on my arrival in Sydney. Evans was a stellar head of Decca in the old days when there was a big time classical music recording industry. And before that he had a distinguished career at the Boston Symphony. Never run an opera company - but, lucky fellow, he doesn't have to as he has a terrific General Director colleague in Patty Beggs who looks after everything just beautifully. His operatic knowledge is considerable, his standards are the highest. Just look at the Decca catalogue. He comes out of the top drawer. Good for Cincinnati! I am safely installed in my Sydney hotel - the Intercontinental nicely convenient for the Conservatorium where my auditions are tomorrow. More news later when I discover my sanity again after that 24 hour journey to this other side of our world. I have a meeting first thing after I arrive with the designers of our new Entfuehrung for next season. Just to see that they are on the right track and are keeping to our almost invisible budget. COT are masters of the art of getting value for money – or should I say “no money”? Then a lunch date with Sharolyn Kimmorley, for years a pillar of the Australian Opera (now called Opera Australia) and now Chair of the Opera Department at the Sydney Conservatory with a huge number of talented young Australian star singers of the future. She is getting things organised on Bertelsmann’s behalf so we should have a good turnout for the Neue Stimmen auditions on Saturday. Later in the afternoon on Friday I have COT auditions – and then presumably collapse in the hope of sleeping for a good twelve hours to prepare myself for the real work on Saturday. I will have lots to report over the coming days – including restaurant notes of course, and pictures of the Opera House and the Bridge etc etc. Above you see the view from my hotel room in this beautiful city on my last visit in 2003. PS to above - I am very happy that I took an earlier flight to LA than planned because of the impending storm in Chicago. It appears that the flight I was booked on is four hours late and I would therefore have missed my connexion to Sydney and all those lovely things I am doing on Friday! I am now in the Admirals Club at LAX feeling thoroughly pleased. Of course it was my wife who insisted that I do it! Regular readers may remember my reference to Paderewski in my posting of June 21. It is well enough known that Chicago is a great Polish city - and here is Paderewski's house here. It is down the street from friends in Wicker Park where we had a great BBQ this evening. Our July Board meeting is tomorrow - and I go to Sydney on Wednesday. There is much to cram in during this short week. Well, well - two new appointments to important opera jobs in the US go to respected British managers - Glimmerglass to Michael McLeod, at present the Executive Director of the New Haven Symphony and for years the organizational genius behind Sir John Eliot Gardiner - he of the Monteverdi Choir and Orchestra and much else. And the Houston Grand Opera General Director in succession to David Gockley is Anthony Freud, current boss of the Welsh National Opera. David Gockley takes over in San Francisco next season. Anthony Freud is a member of our Neue Stimmen jury so I look forward to spending five days with him in October. We will surely then discuss the odd situation of there being only one "career" opera manager in charge of a British company - Richard Mantle at Opera North in Leeds. The Scottish Opera post is vacant and now the Welsh will of course be looking for a successor to Anthony. Meanwhile the most authoritative British managers are working outside the UK - most notably Sir Peter Jonas in Munich, Nicholas Payne in Brussels, Anthony Whitworth Jones in Porto, and Karen Stone in Dallas. I should also add Felicity Jackson, Director of the Florida Grand Opera Young Artists Program. They are now joined "in exile" by McLeod and Freud. This should be cause for concern. Anyway it will be great to have Anthony in Houston - he has a splendid combination of personal and professional attributes which will ensure his success in Texas. And I am sure he will be as happy and refreshed there as I have been fortunate enough to be in Chicago.